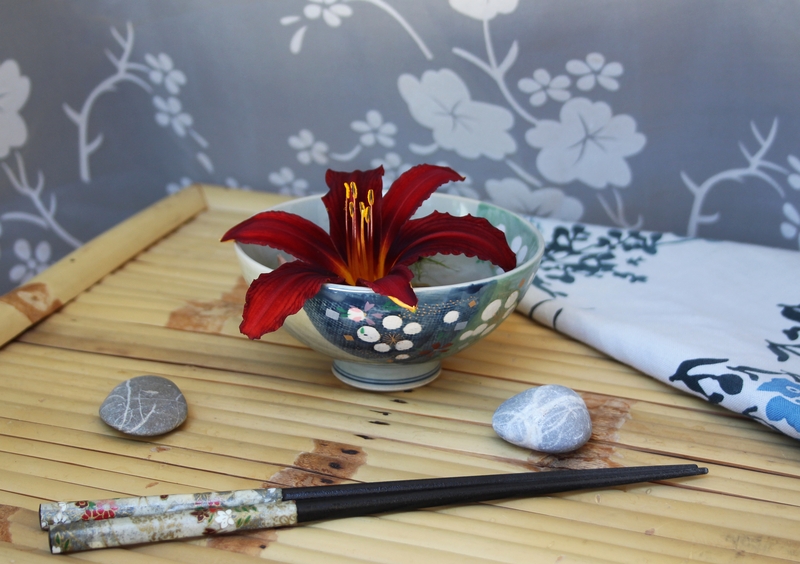 Those of you who follow this meme will know that our wonderful host Cathy, at Rambling in the Garden, has set us a challenge for today; to ‘have a go’ at an ikebana style vase. At first I felt very daunted; many years ago I spent some time teaching in Japan, and one of my students was a Buddhist priest who I taught at his amazing home and temple. His beautiful wife was schooled in all the skills her position required, such as singing, performing the tea ceremony, and of course Ikebana. I often admired her stunning creations. Later on, a visit to a presentation for tourists explaining the background to Ikebana reinforced the idea in my mind that this was an art way beyond my comprehension. However, as this past week progressed, and with encouragement from my sister, I found myself looking at Pinterest, contemplating the possibilities with the tools and plants I have at my disposal, and planning what I might try out. And I started looking forward to participating! One tall Allium sphaerocephalon, a Hydrangea flower and some Crocosmia leaves cut off at an angle, all inserted into floral foam. The vase itself was a present from my sister. 🙂 The three stages of the Leucanthemum at different heights are tied together with grass, albeit invisibly. This was so much fun, despite the intense heat which forced me to give up on capturing the first vase exactly as I wanted. The vase itself, however, was extremely satisfying as it was very simple to put together once planned. A big thank you to Cathy for hosting, and to her and all the other bloggers who post vases on a weekly basis for being so encouraging and inspiring – you are an incredible crowd! This entry was posted in In a Vase on Monday and tagged Cut Flowers, Summer. Bookmark the permalink. Very well done; I think your time in Japan must have seeped into your creative side, all three vases are truly perfect. Thanks. 🙂 It was perfect as a table decoration until the lily closed up in the evening. Oh, so lovely! Your experience of living in Japan sounds wonderful and you’re obviously sensitive to this aesthetic of flower design. Each display is so different and evocative I couldn’t begin to choose one over the other. I like how you’ve made each one a complete little world. Manipulating the crocosmia leaf created a nice, strong shape. The blue and white vase from your sister is gorgeous and it’s nice how you used the temporal stages of the flower to accent it. The bold color of the day lily commands attention, but then the eye is drawn into the rest of the setting to discover the other components. So glad you decided to accept the challenge. I enjoyed these so much. The leaf shapes make a smashing ‘container’ for the flowers on the curtain. Great way to incorporate the surroundings. And your blue vase is a precious gift indeed. All your vases seem to encompass serenity….and I can see the many connections too. Three elegant arrangements. You did a wonderful job and I especially enjoyed your slideshow at the end. Thanks Karen – I really enjoyed this challenge! A lovely group of Ikebana! I think I like the first one best. The thistle is magic. Thanks Amy, it was the first time I have used floral foam, and I think I have jumped a big hurdle now as it was so easy! LOL! LOL, yeah. welcome to real florist land, the green foam is great stuff. Good lord, what an expert. You should be giving us all classes! Most impressive indeed. What a lovely comment Joanna! Thank you! Oh my! Your arrangements are absolutely GORGEOUS!!!! So elegant, I’m so glad you joined in – I LOVE them!!!!!!! Gorgeous, all of them. Again I am feeling serious bulb envy 😉 I have seen Ikebana in a lot of garden shows all over Europe and in New Zealand, but so far I have not been tempted to give it a go! Maybe I am missing out on something, since I adore your 1st piece especially and Cathy’s Botticelli-version. You did a great job, Cathy! I love all 3 arrangements. You did a nice job with the props too – from the floral drape to the chopsticks and stones, they set the tone perfectly. The vase from your sister is beautiful too. I particularly like your first arrarrangement. 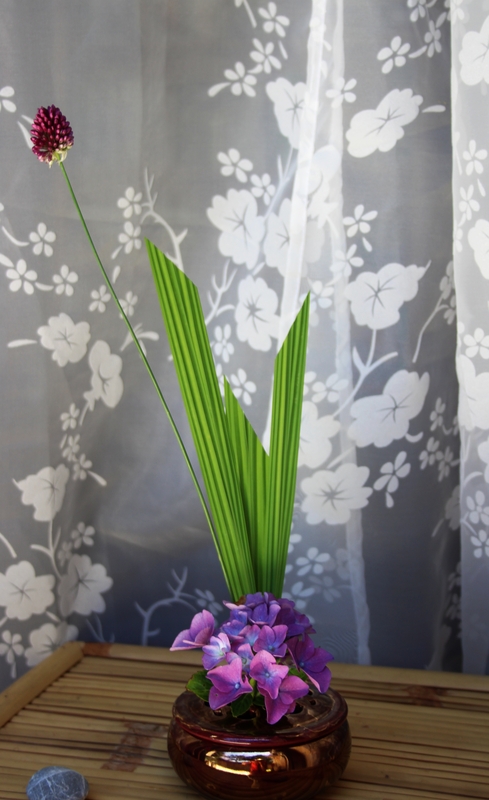 How wonderful to have seen Ikebana in Japan…you certainly learned a lot…the first is stunning with the Crocosmia leaves and that surprising allium. 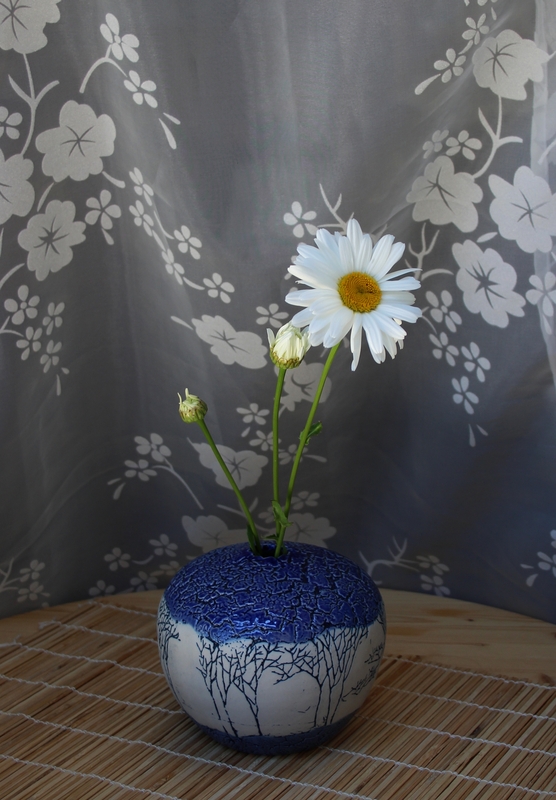 And I love the stages of daisies in that gorgeous vase. All 3 vases simple and beautifully displayed. Wow! What an experience it must have been spending time in Japan. I’ve always admired the grace of the Japanese traditions, and the simplicity and meaning behind the art, the flowers and the traditional homes. I’m sure much has changed, but it’s nice to see these traditions surviving into the western world. Congratulations and well done. It’s beautiful. It’s nice to use your sister’s gift and to have her there for encouragement, too. I think you would like Japan, Alys…. one for the list perhaps! 😉 My sister left on Saturday, so it was good to have the vase project to focus on on Sunday. Have a great week! Let me join in heaping praise upon you…all well deserved. All three are brilliant – well done Cathy. Really beautiful. Thank you Sam. It was a fun idea of Cathy’s to get us thinking! wow your three are stunning. I love the day lily, the vase from your sister and the allium arrangement. Christina I think you cracked it! Faszinierend. Man jede Vase längere Zeit betrachten und auf sich wirken lassen. Spannend! It was such fun, I will definitely try out more such arrangements in the future!